Friday February 15th 1901 Mort took up a load but Will stayed to fix things for the new tenants. I did a lot of baking and was busy all day. They came late in the afternoon but left their things and went on down to [Loans?]. Mort did not come back and their man stayed here all night Saturday February 16th 1901 Will took our cook stove and a lot of other things and I was busy about the work all day. took up the hall carpet. The Womers can not do much at fixing up till we get away. 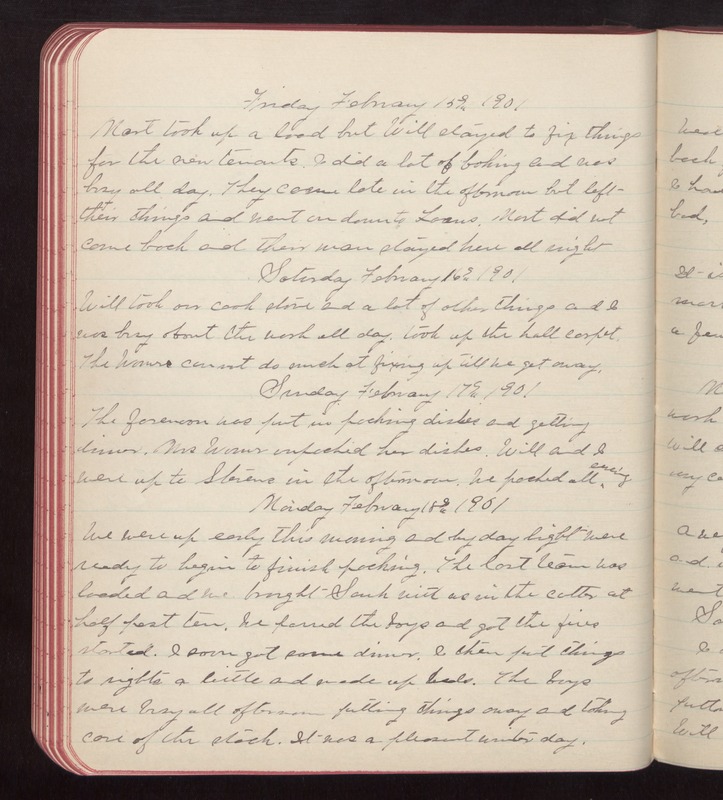 Sunday February 17th 1901 The forenoon was put in packing dishes and getting dinner. Mrs Womer unpacked her dishes. Will and I were up to Stevens in the afternoon. We packed all evening. Monday February 18th 1901 We were up early this morning and by day light were ready to begin to finish packing. The last team has loaded and we brought Sauk with us in the cutter at half past ten. We passed the boys and got the fires started. I soon got some dinner. I then put things to rights a little and made up beds. The boys were busy all afternoon putting things away and taking care of the stock. It was a pleasant winter day.